Members of the North Cambs Hunt Sabs, an organisation that tries to prevent fox hunting, went to a farm in Smeeton Westerby, Leicestershire, to make sure a hunt was being carried out legally on Saturday, November 24. Footage of the day appears to show the members getting ambushed by a man wielding a hammer at around 3:30pm. The dashcam footage appeared to show the Sabs’ vehicle driving up a muddy, country road before encountering a vehicle blockade with two men standing in front of it. The two men then seem to run toward the Sabs. One of the men in a fluorescent yellow jacket appeared to be wielding a hammer. 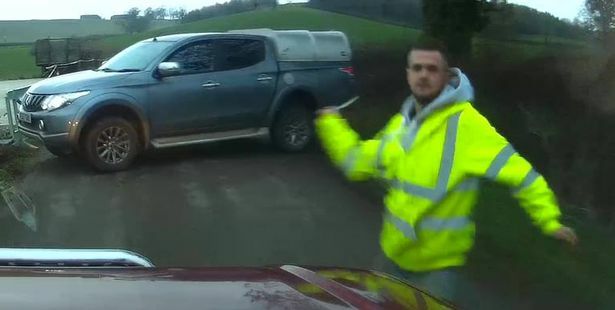 The Sabs’ driver then stopped the vehicle and proceeded to reverse – but the man in the yellow jacket appeared to attack the vehicle with the hammer before throwing it at them. The rest of the footage then showed the man with the yellow jacket chase after the Sabs for a short while – before they get away. The Sabs posted a report on their Facebook page revealing the unsettling events of the day. An image was posted of the hammer head left behind in the vehicle after the alleged attack. The Sabs, however, did point out that despite their misfortune, they managed to carry on. Today (December 3), police have released an image of the man in the yellow jacket to help find him. A Leicestershire Police spokeswoman said: “Officers investigating a report of criminal damage have released an image of a man who may have information about the incident. “On Saturday afternoon on November 24 at around 3.30pm, a woman called police to report her car’s rear passenger window had been smashed in Theddingworth.